Seemingly everyone has downloaded and incessantly played free games like Angry Birds, Fruit Ninja or Candy Crush Saga on our phones, so why are people leaving the comfort of their home, heading to their local arcade and paying money for precisely the same experience? These titles are sitting as equals alongside classic titles of Time Crisis, House of the Dead and Space Invaders in the arcades… and people are flocking to play them. And it’s not just a sparse few avant garde arcades doing this - these adaptations of free mobile games such as Crossy Road, Flappy Bird, Jetpack Joyride and Temple Run are being adopted by amusement arcades around the world. Surely this makes no sense? Surely most people don’t want to head outside and pay for something they can do for free at home? The reason is the same as it’s always been: attracting a new audience and selling them with familiarity. 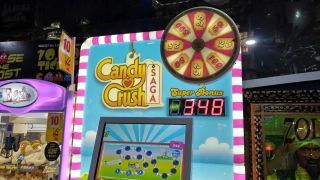 Mobile games have strong brand recognition among younger generations is a massive selling point for developers who license the rights to their gaming titles onto arcade machine creators. Trevor Sutton, Leisure Equipment Controller for Namco UK, told TechRadar, “First and foremost [mobile games] resonate with the younger audience. Smartphones are a necessity rather than a luxury for most people. “Doodle Jump and Temple Run arcade were two of the first mobile games seen in the UK, which entered the [arcades] in late 2012. Temple Run is one of the many mobile games you'll now find in arcades. Sutton confirmed Crossy Road is one of the most popular machines in the lineup of games Namco ranges, but Hipster Whale, the original developers of the title, had a limited amount of influence on the arcade edition. Hipster Whale released Crossy Road in late 2014 and experienced phenomenal success, hitting over 50 million downloads in its first three months. The game is still often in the top 100 games on the iOS App and Google Play stores. After the initial success the team behind the game spotted a rival title in an arcade - Fruit Ninja. The Hipster Whale team then contacted an amusements specialist that creates games for arcades. Adrenaline Amusements – a company setup in 2010 which provides machines for arcades all over the globe – publishes the Crossy Road machine that features a 65-inch screen and flashing lights to entice players. Adrenaline Amusements confirmed to Hipster Whale the game had been a success in almost every market is was available, apart from Italy. Sum admitted Hipster Whale don’t know why it didn’t work in Italy. The whole gameplay mechanic of swiping left and right within Crossy Road has been removed for a simpler tool of just hitting one button to play. Namco UK’s Sutton said, “To this day [Crossy Road] still represents a valuable addition to our machine estate and is very consistent, whereas some of the earlier titles had great initial impact but the novelty value wore off fairly quickly. Playing Crossy Road at home on your own is an experience where you try to beat your own score, but there’s no physical reward for doing so. If you enter an arcade after playing Crossy Road and knowing the way the game works after hours of playing on your phone, you can then succeed in the arcade game. Some arcades even offer extra incentives, known as redemption machines, such as the opportunity to win tickets that you can then trade in for prizes. When playing this game in your local arcade, you can live the stereotype of being the 1960’s whizz on the pinball machine, the bright lights and loud sounds drawing in a huge crowd of onlookers with the added bonus of a larger screen and a prize at the end. Flappy Bird was a gaming phenomenon and you can play it in arcades now. But the similarities between ‘old’ and ‘new’ gaming don’t end there - there’s a clear parallel between older arcade games and modern mobile titles too. Crossy Road, for example, is an 8-bit title with very clear comparison to Frogger. It could be argued the reason mobile games are translating into the arcade so well is that they share the same retro appeal. The Four Quarters, opened in in March this year, is the second arcade of its type in London, and only supplies retro gaming experiences like Frogger and Time Crisis 2 to its customers. Even though Kitching says the arcade wouldn’t include mobile game titles because it doesn’t faithfully fit the retro aesthetic, it's most popular titles show a similarity to mobile games in both art style and mechanics. What is the future of the arcade? Innovation in business is critical - and arcades are no different. With that in mind, it makes sense that titles such as Flappy Bird or Candy Crush Saga may appear in the arcade to drive traffic, but it won’t take over from the Jurassic Park game you love. Innovation will also likely come in other forms as companies look toward virtual and augmented reality gaming experiences to expand the offering of the arcade. A traditional arcade machine for Ikari Warriors - one of our best 50 arcade games. Sutton even suggested app developers could expand their arcade offering with virtual reality titles. Virtual reality would offer a diversified product which is what Sutton wants to offer “value for money” and an “out of home experience” for customers. Arcades have always been great places socially, and their preservation will be welcomed by many. But instead of tired old shooting games, in the future it’s likely we’ll see vintage machines running next to mobile titles alongside larger, incredibly immersive virtual reality arenas. And the grabber machines, of course. They will, inexplicably, never die.